Housekeepers & Nannies & Gardeners, Oh My! - Scarsdale Premier Insurance Agency | Advocate Brokerage Corp.
Housekeepers & Nannies & Gardeners, Oh My! Understanding the risks (and how to avoid them) of employing household staff. Being an Advocate for Every Insurance Need is something we take seriously around here! We are here to serve the needs of the upwardly mobile. To identify potential risks, provide education on how to avoid those risks and to match the best protection so they are covered when the risk turns into a threat. Many families with significant assets (or those on their way there) find it important to hire household staff such as a nanny, au pair, housekeeper, cook, gardener, personal trainer, chauffeur, caretaker, or other types of domestic staff to help their life run more smoothly. Certainly, in many situations your domestic staff seems to become part of the family and when that type of personal relationship is established, it is difficult to look at them as a possible threat. However, we feel that with today’s increased threat of lawsuits, the risk involved is necessary to discuss. First there are legal considerations if you hire help directly. If you do so, legally you become an employer and must obey both state and federal laws and regulations. This means you must supply your employees with a variety of documents, including W4 withholding for federal taxes. You must have workers’ compensation insurance to cover employees for work-related injury as well as statutory disability coverage for injuries not related to the job. The penalties for a lack of coverage are very severe and need to be taken seriously! It is wise to consult an attorney before you do any hiring. You may find it’s in your best interest to work through an agency that supplies domestic help rather than becoming an employer yourself. You also need to consider claims that can be filed against you including wage disputes, labor laws, sexual harassment, wrongful termination or discrimination. These are issues often worried about in business settings but often forgotten in domestic situations. Even domestic help without legal status have the right to sue their employers. Aside from workers’ compensation, you need to be sure to adequately protect yourself from personal injury claims that can be filed by your domestic staff. The stakes become even higher if you are a high profile person. Reflect for a moment on the multitude of media headlines surrounding claims of former domestic staff made against their famous, wealthy, head of the company employers. In some cases the claim alone caused damage! Talking to legal council before making any hiring decisions. Hiring staff through an agency specializing in domestics. Ask for permission to obtain a copy of their driving history. This can affect many things not the least of which is the safety of your family. Utilizing a written employment agreement. o Include mediation provisions as well as confidentiality agreements. Employment Practices Liability insurance (find out more by contacting your Advocate Brokerage consultant). Workers’ compensation and statutory disability coverage as required by law. Having a high-limit on your personal liability portion of your homeowner’s policy. At Advocate Brokerage, we specialize in assisting those who employ household help, securing the coverage they need. In tandem with legal counsel, Advocate Brokerage can help make sure that you, your family and your assets are protected when hiring domestic staff is necessary to help keep your home running smoothly. 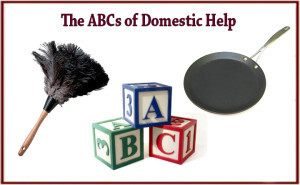 Have you, a friend or family member ever had an issue with domestic help you have employed? Share your experience; the things you learned along the way could be a big help to others!